My friend Stephen Pollard is a creative political thinker for whom I have much respect. A couple of years ago the Centre for Policy Studies published a pamphlet by Stephen in which he offered disinterested policy advice for the Conservative Party after its three successive election defeats. He summarised his argument in an article for The Guardian, where he proposed that the Tories champion "genuine public-sector reform, based on equality of access, and buttressed by individual liberty". To that end, he argued for policies including school vouchers and a flat tax. I have no stake in internal Tory debates. Though I consider Gordon Brown has disfigured public life with his prolonged disloyalty to the Prime Minister, I still back a Brown-led Labour Party against David Cameron. But I believe strongly that the best system of government for a mature democracy is one where two parties of, respectively, the moderate Left and the moderate Right dominate the political system and compete for the centre ground. That aim will be set back if the Tories act on Stephen's recommendations. I argued here against the Conservatives' proposals for a flat tax. (I reproduced here the Shadow Chancellor's reply, which appears to have been truncated on The Times's website.) I haven't written about school voucher schemes, but I believe their advocates greatly overestimate the efficiency gains and overlook the inequitable consequences. Vouchers would in effect subsidise those who already send their children to private school - an outcome I can see no merit in. So what's the marvellous notion that David Cameron's Conservatives have come up with? Ditch any remaining attachment to the one proven, successful type of state school that's left. In a speech, David Willetts, the Shadow Education Secretary, announced that although a David Cameron government would not close down the 164 remaining grammar schools, they would ignore them in their plans. In other words, when it comes to selecting pupils by ability, nothing separates the Conservatives from the most extreme Left-Wingers of the Labour Party. It's no travesty; it's a recognition of the principles of equity and (which is not at all discreditable) political prudence. The battle within the Conservative Party over selective education was closed not last week but under the last Labour government - at the 1977 Conservative Party conference, where the grammar schools' most articulate champion, Norman St. John-Stevas, accepted that there could be no return to the 11-plus examination. 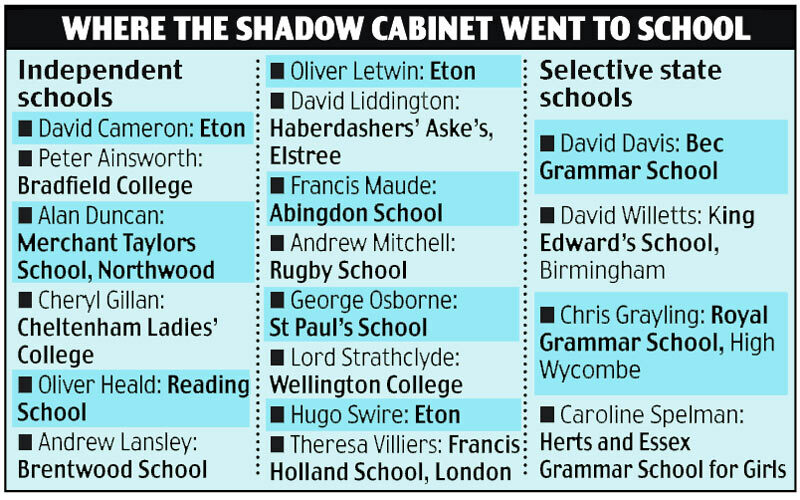 The only notable consequence in this context of the Tories' taking office two years later was the continuation of around 150 grammar schools, while some 85% of secondary school pupils went to comprehensives. This dominance of comprehensive education will not change, for the practical reason that selective education is the opposite of parental choice, and parents will not stand being treated like that. Existing grammar schools are in effect a sectional interest; the Conservatives will not be a national party while they are identified with this minuscule segment of the education system.